Stone Soup for Five: What's in my prayer binder--the final sections! 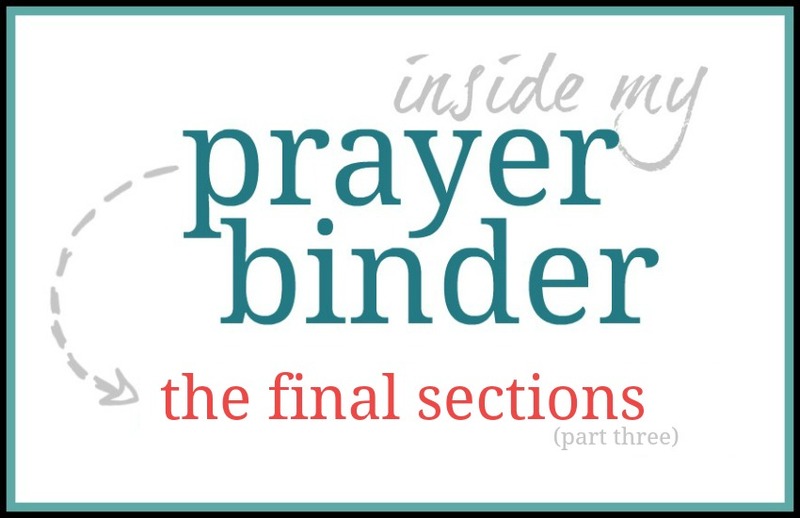 What's in my prayer binder--the final sections! The first part of my family section starts off with my husband. I won't flip through all of these pages, but I'll give you a basic run-down. I have this first half sheet of cardstock that I have four areas I can pray through for him: Current external pressures, areas he needs encouragement, issues he might deal with soon, positive things I've noticed. As I flip to this page, I'll jot down something, or review something I wrote earlier and turn it into a prayer. I love how they get me thinking about what he is dealing with and helping me understand and empathize with him and pray very specifically. I also have Monday through Friday tabs that I sometimes pray through, but not always. Each day has a different theme. For example, Monday I might be praying for his walk as a follower of Christ, Tuesday for him as an employee, Wednesday for him as a father, etc. For my boys it's much the same thing. On the left page, I printed out a copy of the final prayer Clara prays at the end of the movie The War Room. I love it so much and have personalized it a bit. Each of my boys' sections are pretty close to the same. I have different specific verses for them, based on current needs, but they all pretty much look the same. Here are some snippets of verses I'm praying. I also have Monday through Friday tabs for each of my boys, with different themes for each day, just like I do for my husband. Sometimes I flip through those, sometimes I just camp out on verses or other pages. It's all very loose and I really try not to let my prayer binder own me. It's a tool, not a checklist to follow. I figure God knows my heart better than I even do, so I use this mainly as a way to focus and think on Him as I'm praying for those I love. I also have this quick prayers half sheet that I use if I don't have much time to pray for them. I wrote down some main areas to pray for them (these are the topics for my Monday through Friday tabs too), and I wrote one verse under each that kinda sums up my prayer for them. And, now my final section has changed from Monday through Friday tabs to one "et al" (Latin for and others). This is my catch-all section where I have things ranging from prayers for the President, thoughts on prayer, messy journaling notes, and a bunch of other miscellaneous things. You might still want to do the Monday through Friday tabs I had in the previous prayer binder, using each day to pray for a specific area. For example, Monday you could pray for the nation, Tuesday for the world, etc. Both of those ways work well for me. One of those other things in this section is my reflect section. Like most things in my prayer binder, I don't always get to here, but I can tell you that without a doubt, when I do, my day always goes smoother. Just thinking through this section and jotting notes in my Bullet Journal makes such a difference! And as a guide for praying when I'm not sure what to pray. That's it for my prayer binder! If you have any questions, be sure to leave them in the comments below. Later this week on Wednesday, May 16th, I'm going to do a flip through video of my binder on Facebook and will be talking with others and answering questions, so be sure to catch that. You can my Facebook page here, and join the Journal and Doodle Facebook group here (a free private Facebook group where we interact more). If you haven't subscribed to the blog yet, you're missing out on your free full length study of Journal and Doodle through Ephesians! Subscribe now and discover the creative approach to inductive Bible study!